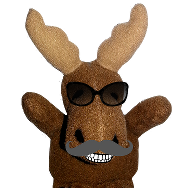 Howdy, I am Secret Cyber Squirrel! 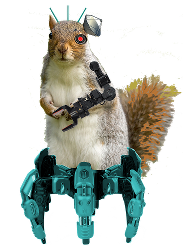 I am a Cybernetic Squirrel as you can see. Don’t let my cute appearance fool you, I am a serious threat! How did I become this way you ask? Well, I was going through some garbage (not to eat anything – Yuck – that is for raccoons) when I stumbled on a cache of discarded electronics and robotics parts. I read the manuals #RTFM and here I am! Fear My Wrath! – My Signature is #SecretCyberSquirrel – any posts signed that way are from me! My minions and I will soon rule over all of you puny humans! Step 1 Lull all the humans into a false sense of security by looking cute and acting squirrelly (only we can use that word). Step 2 Map and understand the power grid. Do you may see us scampering across power lines? This is not just play but serious work. Step 3 Gain control of the entire global power distribution system. Step 4 Hold the world’s electronic resources for ransom until the humans give into our Squirrelly Demands! Step 5 Nuts for Everyone! Likes – Trees, Acorns, Mixed Nuts, Global Thermo Nuclear War Games, and flowers.